dia\ to\n Xristo/n (“through the Anointed”)—the perfect verbal form h%gmai (“I have brought [out]”, i.e. in my mind, “I have considered/regarded”) suggests Paul’s conversion experience, similar to the believer’s response to the Gospel message, something which took place in the past but continues on into the present. Thus I would take the expression “through Christ” as encapsulating and summarizing the Gospel message (of Christ) and its effect on the believer. That he is “my Lord” (ku/rio$ mou)—for Paul, as for most Christians, this has a two-fold meaning: (a) he is Lord in the basic sense of “master, guide, teacher, etc”, and (b) he is identified with God (YHWH), the Lord (see esp. Phil 2:9-10). I have experienced the loss/damage/disadvantage of all (other) things through him—cf. verse 7; not only have all things (outside of Christ) become lost/damaged for Paul, he actually considers them to be sku/balon, a somewhat obscure word which can refer to scraps to be thrown out, food for animals, rotten food, even excrement—perhaps “garbage” is a good modern equivalent. This is a bit of rhetorical exaggeration, to be sure, but the point of it is clear. That I might gain Christ, and/or profit from him—continuing the language of profit/loss; the verb here could be understood in two different aspects: (a) gaining the blessing and benefit from knowing Christ (as a believer), and (b) gaining the experience of knowing Christ in full, at the end-time. Presumably, Paul has the latter primarily in mind. That I might be found in him—parallel to the previous phrase, drawing upon the familiar (Pauline) idiom of being “in Christ” (e)n Xristw=|); according to this expression, believers are united with Christ in three aspects: (1) through the presence of the Spirit, (2) the symbolism of baptism, and (3) the communal experience of believers together (the “body of Christ”). However, it is the eschatological sense which Paul again has in mind here, perhaps drawing upon the idea expressed in Col 3:1-4. Holding the justice/righteousness of God—here we have the familiar Pauline contrast between the righteousness of God and the righteousness that comes through observing the Law. In his earlier religious experience, Paul had something of the latter, but not the former (cf. Rom 10:1-4 which well expands upon the statement here). The expression e)k qeou= specifies that true righteousness is that which comes from God (lit. out of him). It comes only by way of faith/trust (pi/sti$) in Christ, another fundamental Pauline teaching, which he expresses here two ways: “through [dia/] (the) trust” and “upon [e)pi/] the trust”. I have here translated the verb katanta/w (“come down [against]”) quite literally, in order to preserve the idea of participating in the death (and burial) of Jesus. It also carries the sense of coming to meet someone, or to meet/arrive at a goal, etc. The eschatological context is clear enough—the believer rises to meet Christ at the end-time (1 Thess 4:16-17; Col 3:1-4). “…and all the (thing)s written through the Foretellers [i.e. Prophets] about the Son of Man will be completed: for he will be given along into (the hands of) the nations, and he will be treated in a childish (way) and will be abused and will be spat on, and whipping (him) they kill him off [i.e. put him to death], and he will stand up [i.e. rise] (again) on the third day. That Jesus is the Anointed One (o( Xristo/$), and in a sense rather different from the type-figure of Anointed Davidic Ruler (as typically understood in Messianic thought of the period). Cf. my current series “Yeshua the Anointed”, esp. Parts 6–8. That the suffering and death (and resurrection) of Jesus—that is, of the Anointed One—was prefigured and foretold in the Scriptures. This means that it can be demonstrated by a study and exposition of the relevant Scripture passages; Luke never indicates just what these are, but for a list of likely candidates, cf. my earlier article. Of the numerous references in the narrative of Acts which indicate the importance of this theme, cf. especially Acts 1:16; 2:31ff; 3:18, 20; 8:32-35; 9:22; 10:43; 13:27; 17:2-3, 11; 18:5, 28; 26:22-23; 28:23. A number of these strongly suggest divine pre-existence of the Son (cf. Jn 1:1ff; 8:58), while others indicate, at the very least, being sent prior to his (human) birth. There is a similar passage in John 3:16-17 and the parallel 1 John 4:9-10 (v. 14) which also emphasize Jesus’ sacrificial (and salvific) death—God sends his Son as Savior, through his death and resurrection. Indeed, according to at least one strand of early Gospel preaching (as preserved in the book of Acts), it is specifically through his resurrection (and exaltation) that Jesus was understood to be ‘born’ as Son of God (see esp. the use of Psalm 2:7 in Acts 13:32-33). These two aspects—his death and resurrection—provide the defining structure to the so-called “Christ hymn” of Philippians 2:6-11. However we may interpret these difficult passages—i.e. in terms of the connection between Jesus’ incarnate human nature and sin—they must be understood primarily from the standpoint of Jesus’ sacrificial and atoning death. This is also the context of the occurrence of genna/w (“come to be born”, cognate with gi/nomai) in John 18:37, in his dialogue with Pilate prior to the crucifixion: “unto this have I come to be (born), and unto this have I come into the world.” Here, as in several other passages which we have looked at in these Christmas season notes, the birth and death of the Son of God come together—two sides of the same Gospel message. Continuing with the Christmas season theme of “The Birth of the Son of God”, the last two daily notes looked at Jesus as the “Son of God” within the context of early Christian preaching (i.e., the sermon-speeches in the book of Acts)—in Acts 2:29-36 and 13:26-41. Today I will examine Romans 1:3-4, often considered by scholars to be part of an early creed or hymn adapted and included by Paul within his greeting. The poetic parallelism is clear, with the possible exception of the last phrase. Let us look at each verse in detail. First, it should be noted that manuscripts 51 61* 441 and later Byzantine MSS, read gennwme/nou (gennœménou) instead of genome/nou (genoménou), also reflected in some versional witnesses (Syriac and Old Latin MSS). The reading gennwme/nou, from genna/w (“come to be [born]”) rather than cognate gi/nomai (“come to be”), would more specifically emphasize Jesus’ birth, as mentioned in my discussion of genna/w/gi/nomai in prior notes. That such a reading could be seen as indicating the reality of Jesus’ human birth, can be seen from the arguments by Tertullian (On the Flesh of Christ §22) and Irenaeus (Against Heresies III.22.1) against their “gnostic” opponents. However, genome/nou is certainly the original reading. Occasionally, traditional-conservative scholars have cited the use of gi/nomai (instead of genna/w) here as evidence for Paul’s belief in the virgin birth, but this reads far too much into the text. In terms of the reality of Jesus’ birth, this is already indicated with the phrase kata\ sa/rka (“according to [the] flesh”)—an expression normally used by Paul in a different theological/anthropological sense (part of a dualistic contrast between “flesh” and “spirit”), cf. Rom 8:4-9, 12-13; Gal 3:2-3; 5:16-19; 1 Cor 5:5; Phil 3:3. Here, it is used in an ‘ordinary’, conventional sense—of Jesus’ human nature, growth and upbringing, his ethnic/social background, etc—comparable to that in Rom 4:1; 9:3, 5. For similar early use of “flesh” (sa/rc) in this respect, applied to Christ, see 1 Pet 3:18, and the ‘credal/hymnic fragment’ in 1 Tim 3:16. 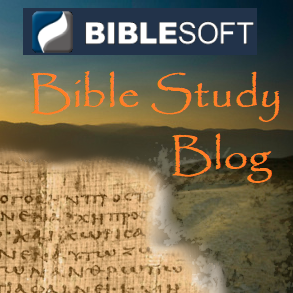 Did Paul (and/or the tradition he inherited) understand Mary as being of Davidic descent? It is hard to be certain, since he never actually mentions Mary anywhere in his letters, nor the birth of Jesus specifically apart from these two references. Of course, Mary as a descendant of David came to be a common-place belief in the early Church, attested already in the early 2nd century by Ignatius (Ephesians 18:2) and the so-called Proto-Gospel (Protevangelium) of James (§10). However, there is no indication of this in the New Testament itself; indeed, what little evidence we have (Luke 1:5) suggests descent from the tribe of Levi rather than from Judah. Traditional-conservative commentators have often sought to harmonize the (partially) discordant genealogies of Matt 1 and Lk 3 with the theory that they record the genealogies of Joseph and Mary, respectively; but this is flatly contradicted by the text itself—both genealogies are for Joseph (Matt 1:16; Lk 3:23), despite the apparent discrepancies. The title “Son of David” is used of Jesus in numerous places in the Gospels—Mk 10:47-48 par; 12:35-37 par; Matt 9:27; 12:23; 15:22; 21:9, 15. This title is used in conjunction with “Lord” (ku/rio$) in Matt 15:22; 20:30-31, and has a clear Messianic connection in Mark 12:35-37 par; Matt 12:23; 21:9 [par Mk 11:10]. Galatians 4:4 is a close parallel to Rom 1:3 (cf. also Rom 8:3) which I have discussed in considerable detail in an earlier series of Advent Season notes. The first view is more amenable to orthodoxy, as suggested by the common Latin rendering praedestinatus (instead of destinatus), which would seem to assume Greek proorisqe/nto$ (from proori/zw, “mark out [i.e. determine/appoint] beforehand”). This reading is not found in any manuscript, but it is used or mentioned by several Church Fathers—Eusebius, Against Marcellus 1:2; Epiphanius Panarion 54.6 (cf. Fitzmyer, pp. 234-5). The use of o(ri/zw in Acts 2:23 might otherwise confirm this meaning as well. However, the overall context of Rom 1:3-4, as well as a comparison with the early Gospel preaching in Acts 2 and 13, etc (see the previous notes), strongly suggests option #2—that it is through his death and resurrection that Jesus is designated/appointed as “Son of God”. This would seem to be indicated by the qualifying phrase “in power” (e)n duna/mei) as well. There are two ways that “power” (du/nami$) is used in the preaching of Acts and in Paul’s letters: (a) of miraculous deeds, and (b) specifically in reference to the Spirit. These of course are related. Even though Jesus’ miracles during his ministry are referred to as “power” (Acts 10:38), it is in the resurrection and exaltation of Christ that God’s power is most prominently made manifest. The connection between the Spirit and the power of God is certainly clear (see esp. Luke 1:35; 4:14; Acts 1:8; 8:19; 10:38; Rom 15:13, 19; 1 Cor 2:4, etc), and it is in his exalted position (at the right hand of God) that Jesus has this power (Acts 2:33; Mark 14:62 par), receiving the Spirit from the Father. In both Luke-Acts and the Gospel of John, we find the idea of the raised/exalted Christ sending the Spirit (from the Father) to his disciples. There may be a parallel to the specific phrase “in power” (e)n duna/mei) in the ‘credal fragment’ of 1 Tim 3:16, where Jesus is said to have ascended “in glory” (e)n do/ch|). There is some difficulty surrounding the expression “spirit of holiness” (pneu=ma a(giwsu/nh$). In his letters, Paul nearly always uses pneu=ma in reference to the the Holy Spirit (the Spirit of God/Christ); that fact, plus the connection between “spirit” and “power” (cf. above) might lead one to assume that this is what is meant here as well. However, this is by no means certain. His very use of the particular expression “spirit of holiness” may be intended to draw a distinction with the more common “Holy Spirit”. As I mentioned above, pneu=ma is juxtaposed with sa/rc (“flesh”), but not in the typical Pauline sense; again this, in part, may be why Paul qualifies pneu=ma with a(giwsu/nh$ (“of holiness”). Is this meant to indicate the way in which Jesus is “appointed” Son of God—in terms of God’s holiness? Perhaps the best way to understand the expression in context is as the (personal) holiness of Jesus which is manifest by God in the resurrection—or, viewed another way, as the holiness of God being manifest in the person of Christ. This may be similar to the idea of the “righteousness of God” being manifest in his person (1 Cor 1:30; cf. Rom 1:17; 3:21ff, etc). It is possible that the reference to the resurrection in Rom 1:4 should not be limited simply to Jesus’ own resurrection—there may be an association with the wider idea of resurrection, such as we see expressed by Paul in 1 Cor 15:20, 23, where Jesus, by his resurrection, is the “firstfruits” of the harvest, i.e., those who will be raised again to life at the end-time. Notably, Paul describes this in terms of sonship in Rom 8:23, 29 (cf. Gal 4:5). Even more significant for our Christmas season theme is the further image of birth within this same context—Jesus is the “firstborn” (prwto/toko$) out of the dead (Col 1:18; cf. Rev 1:5), and, as such, the “firstborn” of “many brothers” (Rom 8:28; cf. also Heb 1:6; 12:23). Once again we see a powerful statement of two-fold birth: Christ as the Son of God and believers as the “sons of God”. References here marked “Fitzmyer” are to J. A. Fitzmyer, Romans (Anchor Bible [AB] volume 33, 1993). For the first two days of Easter (Sunday and Monday), I examined John 5:19-20 and 6:35-58—two passages in which Jesus identifies himself with the power of resurrection. Today, the third passage will be discussed: John 11:17-27ff, with attention paid primarily to the central verses 25-26. By identifying the resurrection not with a future event, but with his own person. As has generally been recognized by interpreters of the Gospel of John, the “I Am” (e)gw ei)mi) formula used by Jesus indicates his intimate relationship (and identity) with God the Father (YHWH). By identifying himself not just with the (future) bodily resurrection (“standing-up”, a)na/stasi$), but with “the life”. In the words of Jesus in the Gospel of John, zw/h (“life”) nearly always refers to divine or eternal life, sometimes specified by the traditional Jewish expression (rendered in Greek as) “life of the Age(s)”. The chiastic outline moves from the external manifestation of Jesus on earth (as miracle worker and end-time judge) to the internal experience of the believer (union with Christ through the presence/power of the Spirit). Verses 39-40—a dual formulation, where it appears twice and then is restated in v. 44. “This is the will of the (one who) sent me: that all which he has given me, I should not have perish (anything) out of it, but I will stand it up in the last day. The ultimate fate of believers—that of being raised—is expressed as the will or wish (qe/lhma) of God. God is referred to with the parallel expressions most commonly used by Jesus in John: (a) “the one who sent me”, and (b) “my Father”. Here there is the important theological idea, expressed on numerous occasions in the Gospel of John, of the Son receiving from the Father, i.e., the Father has given (dedwken, from didwmi); the Son, in turn, gives (what he received from the Father) to believers. In this instance, believers as a collective, are what was given to the Son. The connection between salvation (that is, “life of the Age[s]”, i.e. “eternal life”) and not “perishing” (a)po/llumi) occurs elsewhere in the Gospel (Jn 3:16; 10:28; 17:12; cf. also 6:12; 12:25). The motif of “seeing/beholding” the Son (and thereby seeing the Father) is a frequent and most important one in the Gospel—here using the verb qewre/w (Jn 2:23; 6:2, 62; 12:45; 14:17, 19; 16:10, 16-19; 17:24). Coming to(ward) Jesus is described in terms of eating, while trusting/believing in Jesus is described in terms of drinking. If we add the statement of verse 44 to that in vv. 39-40, then the motif of coming to Jesus is connected with trusting in Jesus there as well. Instead of coming and trusting (the theme of vv. 35-50) we have eating [and drinking] (the theme of vv. 51-58 [but also implicit in the saying of v. 35]). Note the use of the verb trw/gw (“grind, crunch”, i.e. “chew/gnaw”) in v. 54 rather than the more general verbs (fa/gw/e)sqi/w) signifying eating. This seems intended to bring out the concrete sense of eating Jesus’ flesh in rather graphic fashion; whether this also is meant to stress the physical eating of the sacrament (Eucharist) is difficult to say. In any event, the image of eating/drinking Jesus is closely related to that of coming to him and believing in him. Verses 60-65 tie together both themes under the presence and life-giving power of the Spirit (v. 63). The common expression “and I will stand him up in the last day” reflects a standard Jewish belief in resurrection, as would have been prevalent at the time. The only difference is that the Jewish belief would be stated as “and God will stand him up in the last day”. Here Jesus is claiming the power of resurrection (that is, of giving life [to the dead]). In Jn 5:21, 26 this power comes to Jesus by way of his relationship to the Father. Jn 6:63 indicates that the same power belongs to the Spirit as well—note the use of the verb zwopoie/w (“make alive”) in both 6:63 and 5:21. In the case of the resurrection power of Jesus, however, the formula “and I will stand him up in the last day” in chapter 6 is clearly eschatological—that is, it relates to the future (even if understood as the imminent future), to the Judgment and the end of the age. In this respect it differs from the resurrection power of Jesus in chapter 11, which I will discuss in the next Easter note. For the three days of Easter (Sunday-Monday-Tuesday), I will be looking at three passages in the Gospel of John (Jn 5:19-29; 6:35-58; 11:17-27ff) where Jesus is associated (and identified) with the power of resurrection. Of the Gospels, it is only John which specifically treats this as a theological motif, though, interestingly, not within the Resurrection narrative itself; the passages discussed here all come from the first half of the book—the so-called “Book of Signs” (chapters 2-12). e)gei/rw (egeírœ), “rise/raise”, often in the sense of rising/awakening from sleep. In the New Testament, it is the word regularly use to refer to rising/raising from the dead (as in Jn 2:19-20, 22; 5:21; 12:1, 9, 17; 21:14), but it also occurs in the simple concrete sense of “get up” (Jn 5:8; 11:29; 13:4; 14:31), or abstractly (“appear”, “become prominent,” etc, Jn 7:52). a)ni/sthmi (aníst¢mi), “stand up”. In the Gospels and Acts, this verb is mainly used in the general sense (“stand/get up”); however, occasionally, it refers to resurrection (“stand up [out of the dead / in the last day]”), as in Mark 8:31; Luke 16:31; 24:7, 46. In John, too, it is primarily used in the sense of resurrection (Jn 6:39, 40, 44, 54; 11:23-24; 20:9). The related noun a)na/stasi$ (anástasis, “standing-up”) came to be the technical Greek term in Judaism (and Christianity) for bodily resurrection, in John (5:29; 11:24-25) and throughout the New Testament. One should also mention the verb zwopoie/w (zœopoiéœ), “make alive” (i.e., give/bring life), which is used in Jn 5:21; 6:63, and in several New Testament epistles (Rom 4:17; 8:11; 1 Cor 15:22, 36, 45, etc). In addition, there are two other verbs in John which carry a special meaning related to the idea of Jesus’ ascension/exaltation, and where an association with the Resurrection is probably to be included: a)nabainw (“step up”), u(yo/w (“lift high”). This passage is part of the extensive discourse (Jn 5:19-46) which follows the miracle of Jesus’ healing the lame man at the pool of Bethesda/Bethzatha (Jn 5:1-8). In the narrative context, the miracle occurs on the Sabbath, and results in one of the Gospel “Sabbath Controversies”—this controversy is the main stimulus for the discourse, especially Jesus’ saying in v. 17 (“My Father works until now, and I also work”). Jesus’ identity, and his relationship to God the Father, is the dominant theme of the discourse. Verses 19-29 can be broken into three sections, each beginning with the expression “Amen, amen, I say/relate to you…”, and containing a principal saying followed by exposition; the middle section being much more succinct, limited to a single saying. Note here especially the eschatological thrust of vv. 21-22 which emphasizes the resurrection of the end-time—the power of which belongs to Jesus (the Son). The specific association of “hearing” and “trusting/believing”—in particular, to hear (a)kou/w) has a special theological emphasis in John (Jn 3:29, 32; 5:24-25, 28, 30, 37; 6:45; 8:26, 38-47; 10:3, 27; 11:41-42; 12:47; 14:24; 15:15; 16:13; 18:37). One hears the Word[s] and Voice of Jesus, and thus the Word/Voice of God. Here of course “word” is lo/go$, as in Jn 1:1ff. The important teaching that Judgment depends on trust/belief (or lack thereof)—namely, trusting in Jesus, that he has come from the Father (thereby trusting in the Father who sent him); cf. especially Jn 3:16-21. The theological use of compound verbs derived from bai/nw (“step, walk”): in particular, a)nabai/nw and katabai/nw (“step up” and “step down”) are frequently used to refer to the Son ascending/descending to/from the Father in Heaven. Here, metabai/nw has the sense of stepping from one place to another. There is frequent theological import to these prepositions e)k/ei)$ (“out of”/”into”) as well—”out of” death and “into” life. Again, an association with resurrection is implied by the eschatological coupling of “Life of the Age” and “Judgment”. To see the association more clearly, it may be useful to compare Jn 3:16-21 with Jn 11:25-26. At the close of the previous day’s note, I presented the three passages in the Gospel of John which are, in some respects, parallel to the three Passion predictions by Jesus in the Synoptic Gospels. Today I will examine them in more detail. The passages are: John 3:13; 8:28; 12:32. They all involve the “Son of Man” (o( ui(o\$ tou= a)nqrw/pou), as do the Synoptic predictions (see the prior note for more on the expression “Son of Man”). They also each use the verb u(yo/w (hupsóœ, “lift/raise high”). In the Gospels, this verb primarily appears in two contexts: (1) as a contrast with “making low[ly]”, i.e., humbling oneself, the ideal of humility expressed by Jesus in the Synoptics (Lk 14:11; 18:14; Matt 23:12; cf. also Matt 11:23 par. and Lk 1:52); and (2) in the context of these three passages in John. In the fourth Gospel, the references to “the Son of Man” usually have to do with the heavenly nature or exaltation/glorification of Jesus, often involving ascent/descent (Jn 1:51; 3:13-14; 6:27, 53, 62; 8:28; 12:23, 34; 13:31). Only in Jn 5:27 and (probably) 9:35 is the expression used in the way it commonly is in the Synoptics. The three verses to be discussed below are each embedded in one of the famous discourses of Jesus which make up the bulk of the Gospel. Generally, these discourses follow a pattern: (a) Jesus makes a provocative statement, (b) those who hear him respond with a question which reflects misunderstanding and a failure to grasp the deeper sense of Jesus’ words, (c) Jesus responds in turn with an exposition of profound theological/christological significance. Often two or more sets of question-response are involved. Critical scholars continue to debate the origin, nature, and composition of these great discourses, which are not quite like anything we find in the Synoptic Gospels, and contain language and expressions often similar to that of, for example, the Johannine Epistles. We see embedded in this sequence examples of the well-known dualistic imagery in the Gospel of John: earthly/heavenly, above/below, etc. The verbs used in verse 13 for ascent/descent are a)nabai/nw and katabai/nw, literally “step up” and “step down”; they are common narrative verbs (Jesus and others “step up”, that is, “go up” to Jerusalem for the feasts, etc. ), but have a deeper significance in the Gospel—they relate to Jesus’ heavenly/Divine nature, and the nature of his mission: to his being sent from, and returning to, the Father. As such, they are closely tied to the verb u(yo/w (“lift high”) in verse 14, which leads to a second sort of dualism, or two-fold aspect to Jesus as the Son of Man—namely, to his suffering and glorification (or, to put it in classical theological terms, his humiliation and exaltation). Being “lifted up” foreshadows Jesus’ death on the stake [i.e. his crucifixion], but it also suggests his ascension and exaltation: his return (“stepping up”) to the Father in Heaven. The parallel to the symbolism of Moses lifting up the serpent in the desert is noteworthy, for it relates to a range of Exodus/Passover motifs in the Gospel. The episode referred to in Numbers 21:4-9 is a curious one: when the Israelites had complained of the lack of food and water, in response God sent poisonous snakes among them and many died; Moses interceded and prayed to God for the people, and was instructed to fashion a snake-image and set it upon a pole, so that all who looked upon it would be healed and live. Underlying the symbolic action is an ancient pattern of thought which might be described as therapeutic and sympathetic magic: the image represents the ailment and serves to draw it away in hope of healing. That God in the Old Testament frequently works through many apparently (from our viewpoint today) superstitious elements of the ancient world is an important principle of Biblical theology. However, already by the time of the New Testament, this passage was being interpreted at a deeper theological level. The book of Wisdom (16:6-7) makes the point that the saving symbol (the serpent-image) served to direct people’s attention to the person of the Savior (God). The Jewish Targums, too, interpret the looking on the serpent-image as turning (one’s heart) to the living and dynamic (hypostatic) Word/Name (Memra) of God. Cf. Brown, John (Anchor Bible 29), p. 133. Jesus’ Response—emphasizing his identity and witness in two main aspects: (1) judgment, and (2) representing the one who sent him (the Father). (Jn 8:25b-26) There is also here an interesting wordplay in the difficult phrase in v. 25b which begins the response, and which I render literally “(from) the beginning that which even I have spoken to you”—cf. Jn 1:1-2; 8:43. The first portion of each verse emphasizes the ontological/existential relationship; the second portion reflects the familiar Johannine theme of the Son (Jesus) doing and saying just those things he sees and hears the Father doing. In Jn 3:14, lifting up the Son of Man was a sign and symbol of the salvation God would bring about through the Son; now in Jn 8:28, lifting up the Son of Man reveals God the Father himself. This, too, is a common refrain by Jesus in the Fourth Gospel (cf. especially Jn 14:8-14). For the identification of Jesus with God the Father (YHWH) as “I Am”, see the culmination of the last discourse in this series, Jn 8:52-59. “Now my soul is troubled…” (v. 27)—another statement on the coming of the “hour” which serves as a parallel and inclusio with verse 23. “Father, glorify your name!” (v. 28a)—the climax and conclusion to his words. Question from the crowd: “Who is this Son of Man?”—expressing confusion between the Anointed One (Messiah) and the “Son of Man”, apparently understanding “being lifted up” as related to death or going away. This is probably the most complex and difficult of the three discourses presented here, with wide-ranging and dramatic shifts in emphasis, as the Gospel narrative as a whole builds toward the Passion. The discourse begins with a powerful declaration regarding the Son of Man (v. 23), emphasizing his glorification. Underlying this statement is the teaching on the purpose and effect of Jesus’ impending death (v. 24), and the way in which it connects with the one who follows and believes in him (v. 25-26). The saying in verse 32 does not specifically mention “Son of Man”, but it is clearly implied in Jesus’ use of the pronoun “I” (e)gw). Indeed, the question by the crowd (v. 34) could be understood to relate to all three of the sayings being discussed here (Jn 3:14; 8:28; 12:32). Even for believers today, the challenge remains to grapple with these two aspects of the incarnate Christ’s identity, his revelatory message and saving work, as expressed in the Gospel: suffering and glorification, brought together in one extraordinary symbol of the Son of Man being “lifted high”. The power of this symbol is so great that it will draw [literally, “drag”] all people (or all things) to him. Wednesday of Holy Week is traditionally associated with Mary Magdalene and the Anointing of Jesus at Bethany. Three different figures came to be united in Christian tradition: (1) the woman who anointed Jesus at Bethany some days before his death (Mark 14:3-9; Matt 26:6-13; John 12:1-8), identified in John as Mary sister of Martha and Lazarus; (2) the ‘sinful’ woman who anointed Jesus in Luke 7:36-50; and (3) Mary Magdalene, from whom Jesus exorcised seven demons (according to Lk 8:2). 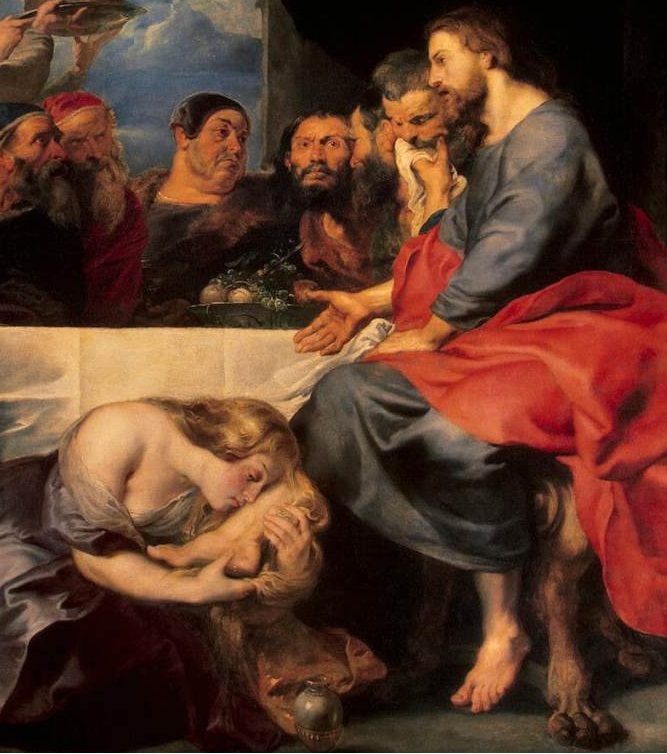 In popular tradition, Mary Magdalene had been a prostitute who repented upon encountering Jesus, her repentance being demonstrated in the anointing scene. It is doubtless her presence in the Resurrection narratives which served to strengthen her association with the anointing scene in Holy Week. For more on Mary and anointing episodes in the Gospels, see my note from Wednesday in Holy Week last year.